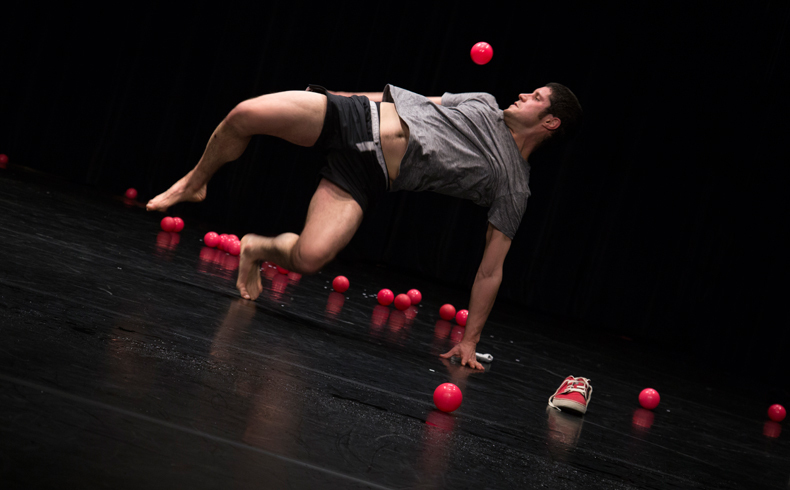 Möbius is a juggling solo in which the performer enters an imaginary labyrinth, balancing between perfectionism and obsession, passing from impotence to elation, and proposing a learning process when things do not happen as they were meant to… dozens of balls, body knots, contortions and surprises. A human being who twists and struggles in all the senses of the words and proposes new rules for juggling, where it seems that anything is possible! Miguel Gigosos, from Valladolid, trained in France at the Lyon Circus School, at Le Lido in Toulouse, and with Iris, one of the great juggling geniuses. His own work is characterized by its physicality, explosiveness and twisted ideas and his shows have already been staged in twelve countries. He recently founded the Iknoto company with Rodrigo Gil, his partner in adventure.